Punggol Waterway Park and My Waterway@Punggol are joint projects by National Parks and HDB. 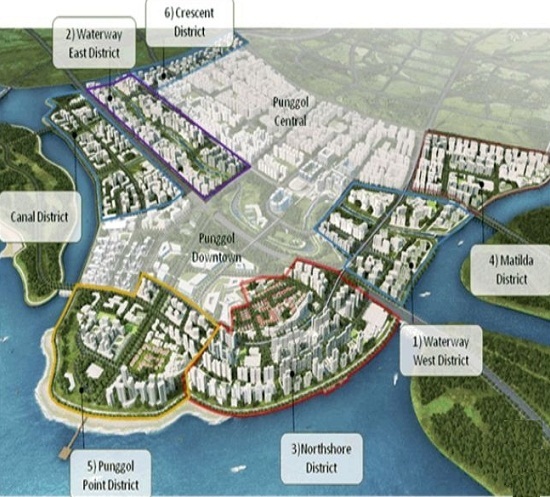 This major project is to transform punggol into a vibrant Waterfront Town. 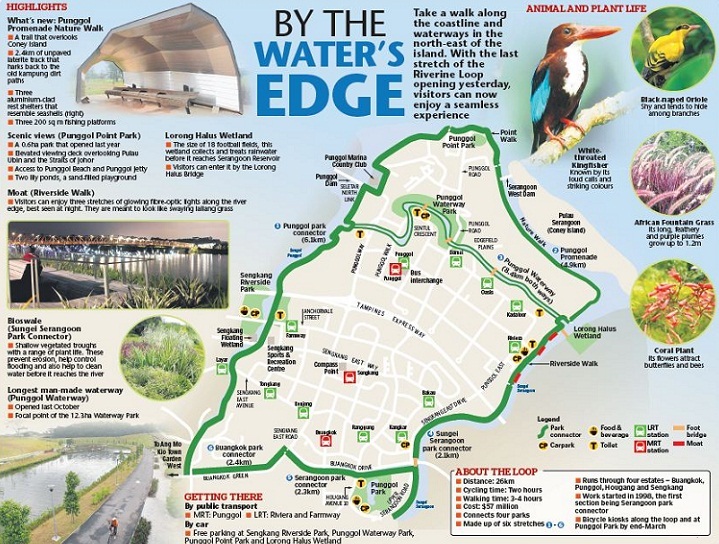 The 4.2km waterway will traverse Punggol Town, Punggol Promenade and link up the reservoirs at Sungei Punggol and Sungei Serangoon to form a huge water reservoir. Punggol Waterway Park is located along Sentul Crescent Road covering an area of 12.25 Hectares. This multi-purpose park is free from the bustling traffic and set in a serene lush greenery setting to serve the residents and visitors. Just few minutes away from the Punggol Town Centre, visitors will experience a nostalgic feel of the Old Punggol and the upcoming waterfront park. By foot: From Punggol Mrt station or Punggol bus interchange, walk about 10-15 minutes from Punggol Central Road to Sentul Crescent Road. By Train: Take the LRT train from Punggol station to Damai LRT station. From there, walk towards Punggol road and follow a path to the Waterway. By Buses: The bus service numbers 3, 34, 43, 62, 82, 83, 84, 85, 136 will bring you to Punggol Bus Interchange. By Car: The Waterway Park is easily accessible by Central Expressway CTE, Tampines Expressway TPE and Kallang Paya Lebar Expressway KPE. Car Parks: There are 2 car parks here; one at Nature Cove with 18 +1 handicap lots and another at Recreation Zone with 15 + 1 handicap lots. Green Gallery: Visitors can enjoy a nature stroll here to admire the nature flora and fauna in the park. is also a fitness corner here that suits everyone. Heritage Zone: Walk down the heritage road along the Old Punggol Road and admire the mature trees and vegetation here. It will definitely bring back nostalgic memories of the Old Punggol Kampong for the older generation. Nature Cove: Over here, visitors can sit around, gather and enjoy the spectacularly beautiful waterfront scenery. They can also carry out leisure activities here. Barbequing: Outdoor barbeque sessions are great social events for family bonding and for friends to gather around. Grab your sauces, food and utensils down to the park for a fun-filled barbeque session to display your great culinary skills. While you enjoy your mouth-watering BBQ food, you can enjoy the glorious beauty of the sun, the spectacular view of the Waterway, taking in the picturesque view of the flora and fauna and the gentle sea breeze. Cycling: On your two-wheelers, you can ride through the cycling paths around the Punggol Waterway Park and promenade to enjoy the beautiful scenery. At the same time you can have a great workout while you ride along. Dining: Pamper your taste buds to gastronomical dining options at the food outlets here. For greater ambience, you can sit by the enchanting pond in Punggol Park and dine in a tranquil nature environment. Exercise and workout: Exercise and a balanced diet will improve your health by leaps. So bring out your sports outfits and head down to Punggol Park for a workout and feel good. For those who like moderate intensity exercises, you can jog, skate or cycle along the paths round the park while you enjoy the nature scenic view of the park. For callanetic exercise, you can do stretching and swinging exercises, sit ups and warm ups at the fitness stations. For those who love mind relaxing exercises like Tai-Chi, Qi-Gong, sword exercises and Yoga, you can make use of the open spaces here to enjoy your activities. Come on down to the park to get in shape and burn some calories. Kite Flying: This is an activity that is popular among children and adults. Have some family fun and bonding time as you fly your kites and let them soar into the blue sky. Photography: Photography lovers definitely have to come down to Punggol Promenade and the Waterway to take scenic pictures of the waterfront, flora, heritage trails and the natural wildlife. Capture the glorious beauty of nature and share it with your friends. Picnics: Run out of weekend activities for the family? Prepare your finger-licking sandwiches and delicacies in a basket and head down to Punggol Waterway Park/Promenade to have a family picnic session while you enjoy the sea breeze, soak up the sun and take in the mesmerizing nature sights. Punggol Promenade Nature Walk: Take a break from the hustle and bustle stressful life and come on down for a nature walk at the Punggol Promenade. This park connector is a 2.4 kilometer nature walk from the Punggol Promenade that lies between Punggol Point Walk and Riverside Walk. The walk also features several fishing platforms that remind us of the old Punggol Fishing Villages. Appreciate Mother Nature’s creation as you stroll along and discover rare tree species and interesting wildlife. Here you can enjoy the paranomic view of the sea and the lush greenery surroundings. Attractions: The main attractions here are the two uniquely designed Rope Bridge and Kelong Bridge that run across the Punggol Waterway Park. Stroll along the bridge , have a feel of the old Punggol Kampung and the present newly constructed Punggol Park.